Georgia is a state with mountains, beaches, cities and backwoods, so it's no wonder the Southern state has some of the best scenic routes in the nation. With thousands of miles worth of interstates, U.S. highways and state roads, the Peach State has its fair share of breathtaking sites. Whether you're looking for curvy mountain roads on which to take your hog, or miles of country with old general stores and flashbacks of the old America, these sites are just a day trip away. Located in North Georgia, this loop takes tourists through the state's majestic mountain scenery. Once leaving the small Alpine village of Helen, the route takes visitors to Brasstown Bald, the state's highest point. From there, the road loops back to Helen through the Chattahoochee National Forest. Another route in the North Georgia mountains, GA 52 will take people from Chatsworth, in Murray County, into the Chattahoochee National Forest. After passing Fort Mountain State Park, the route consists of curvy roads and passing mountain streams before reaching Ellijay, in Gilmer County. Georgia Bulldog fans who have gone to the World's Largest Outdoor Cocktail Party in Jacksonville, Fla. should be familiar with this backroad shortcut to reach Frat Beach in St. Simons. The route goes through several small, Central Georgia towns including Sparta, Sandersville and Wrightsville - home of infamous UGA running back Herschel Walker. 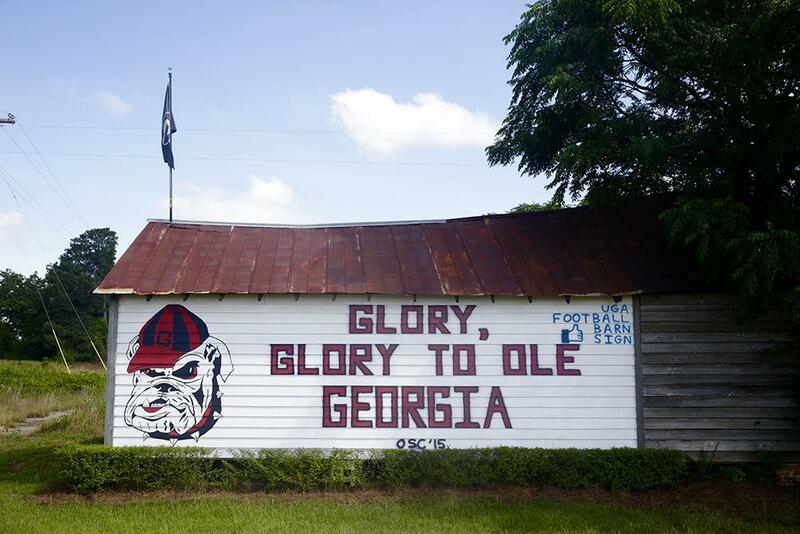 The road also includes the infamous UGA Football Barn Sign, which shows scores from the annual Florida game and other words of encouragement for UGA. The Suches Route or "Georgia's Dragon"
Returning back to North Georgia, another mountain route popular with bikers is the Georgia Dragon. Starting in Dahlonega, you travel north to Vogel State Park, follow Georgia Highway 180 to Suches, then return to Dahlonega. This trip follows many scenic routes while offering numerous lookouts of Southern Appalachia. This route, taking tourists to the North Carolina Highlands or to South Carolina's Lake Country, only spends a short time in Georgia; but the allure of the Georgia road is a treat to bikers as well. There are few intersections, but in the small town of Pine Mountain, you can opt to travel on Warwoman Road, which will bring you to Clayton. Starting in Savannah, where almost every road is a scenic route, follow U.S. 17 to Townsend, Darien and Brunswick to see the sites and taste the foods of Georgia's Colonial Country. Once you're in Brunswick, enjoy some Brunswick Stew, then take the F.J. Torras Causeway to St. Simons Island to enjoy the beach life. Did you know Georgia has the largest blackwater swamp in the U.S.? Hop on Georgia Highway 177, just south of Waycross, to drive to the Stephen C. Foster State Park, for great views of the swampland. Look out for the gators! SHARE with your friends and family if it's about time for road trip to the Peach State.